bilateral space launch agreement, in return for another PRC promise on missile nonproliferation. sanctions on NORINCO, a defense industrial entity, effectively denying satellite exports to China. 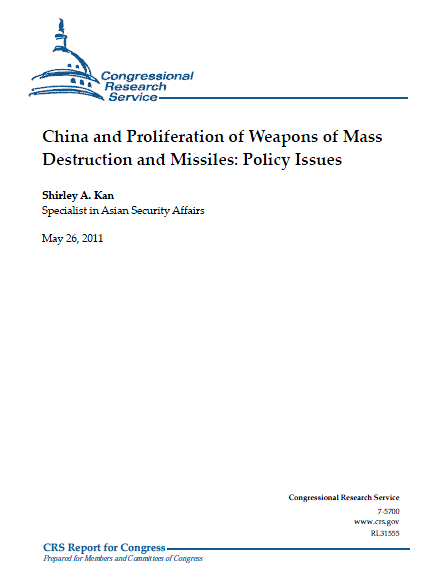 sanctions on six occasions on multiple PRC entities for missile or other weapon proliferation. Skeptics question whether China’s cooperation in weapons nonproliferation warrants the U.S.
U.S. approach relied on China’s influence on North Korea to dismantle its nuclear weapons. increased that China could capitalize in oil/gas deals in Iran as others enforce unilateral sanctions. FY2011 National Defense Authorization Act (P.L. 111-383) relating to nuclear security. questions about China’s effectiveness in using leverage with the power-holders in Pyongyang. Committee on February 24, 2004.
return, in 1982, China gave Pakistan 15 tons of uranium hexafluoride gas for production of bombgrade uranium, 50 kilograms of weapons-grade enriched uranium enough for two bombs, and a blue-print for a nuclear weapon that China already tested, according to Khan. State John Bolton did not cite PRC help in a speech at the Heritage Foundation on May 6, 2002.
for 2010 told Congress in February 2011 that PRC entities supplied missile-related items to Syria.